Jane Krogstad was heeding a divine mandate to heal the land. She planned to transform her farm into a Bio-dynamic organic farm that would wrap around ecologically designed dwellings. Design Coalition designed the site and buildings as part of an interdisciplinary team. 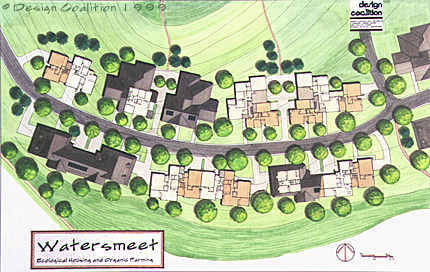 132 passive/active solar condominiums are laid out along village-scale streets that follow the gentle slope of the topography. Only low-toxin materials will be used in the construction. The low-speed roads and careful attention to the design of the outdoor spaces near the dwellings will foster neighborly contacts. A network of walking paths will lead past a community building with a solar-heated swimming pool. Even the street lighting will be carefully designed to preserve the view of the night sky. A leg of the Wisconsin Ice Age Trail, a favorite of bicyclists, winds its way through the site between farm fields and homes and past the artesian spring. On the high ground of the large central 'park' will be a sacred site, yet to be fully envisioned. And if proven structurally feasible, wind-electric generators will top the old concrete farm silos. Environmentally sound water treatment is essential to this project. It is so important that Jane is willing to delay the construction of the dwellings in order to navigate the lengthy governmental approval process for a new treatment technology. This will be either a 'living machine', a greenhouse sewage treatment facility, or an 'engineered wetland'. Both use microbial action and the roots of plants to clean waste water to higher standards of purity than conventional systems, without chemicals. Engineer Dave Flowers is leading the water engineering team. Engineered wetlands will also purify storm water before it flows into the natural wetlands and finally the Fox River. Currently the Krogstads are engaged in the struggle to secure governmental approvals for their project. 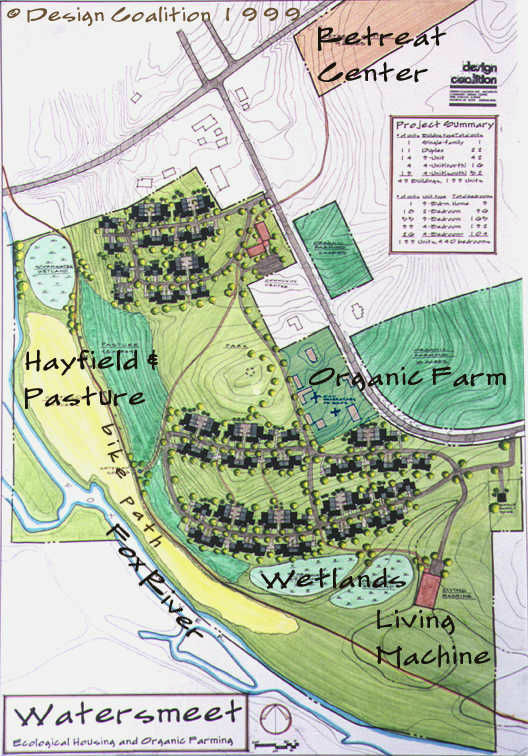 While they wait for the political will to emerge that would allow this integrated community/farming vision to be built, they are proceeding with the organic farm portion. For more details visit the WatersMeet website.